#designatmagee first visited Allingham in 2011 and has been a permanent fixture ever since. The creative showcases and recent award winning short film 'A Walk With Allingham' has inspired the establishment of the 'Inspire Creativity/Engage Enterprise' events bringing an exiting development to the Art & Design component of the festival that Helen Allingham would surely have been proud of. Over the past 5 years #designatmagee has collaborated with LYIT, engaged with FE & secondary schools from both sides of the border in creative practice workshops, brought a visual response to William Allingham's poetry, created the film piece of his life through A Walk With Allingham, inspired young creatives in the area to avail of the national and international experience of world leaders like SpinVFX and showcased established and new creative businesses in the northwest. If you are wondering what happened to those students, find out a little more here. Where it all goes from here, we don't know. Ulster University has cut the course in the recent DEL cuts, where the course will lose 4 staff and 100 students, which puts an obvious dent in the creative ambitions of those involved, but we are hopeful there will be new opportunities in the future. Mark and Padraic looking a little starstruck. The 3 lads went on to work together at Windmill Lane on 'A Walk With Allingham'. Some of the 2013 crew on opening night at the Abbey Centre. 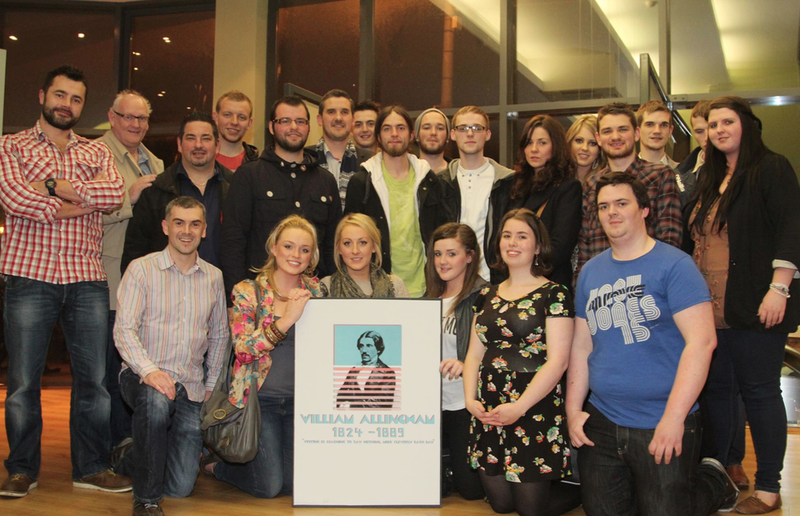 #designatmagee; The original Allingham class of 2011. Much credit must go to the staff that get involved each year.